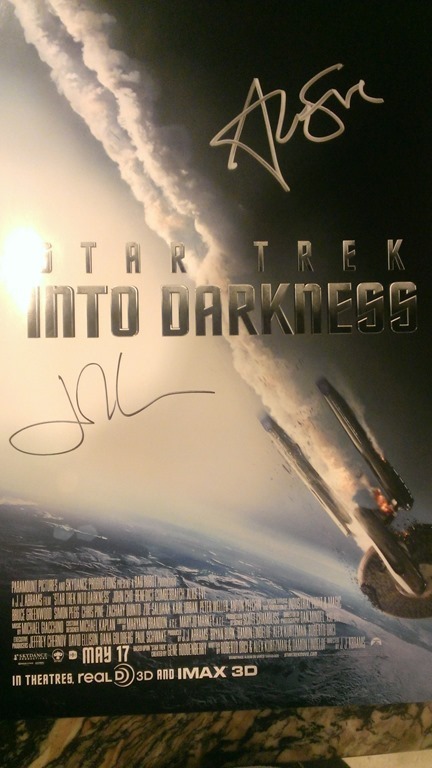 About a year ago, we had a massive, multi-divisional partnership with J.J. Abrams & Star Trek: Into Darkness to promote the movie & our solutions. I’ve never posted the photos from that event but I thought it might be cool to do so for posterity. Because y’never know when we’ll do something like this again. Red Carpet viewing at El Capitan Theatre In Hollywood. Talent signings… Alice Eve & John Cho below. Alice Eve & John Cho are two of the nicest actors you’ll ever meet. And in case it hasn’t been said, Alice Eve is stunning in person. And you might not know it at first, but John Cho? The dude is ripped. He looks like a professional basketball player. My son shared his favorite toy, ‘doggie’, with Alice Eve. She was so taken by him that we held up the meet-and-greet line that you see in the background for several minutes while she played with him. This entry was posted on Thursday, June 12th, 2014 at 9:17 pm and is filed under Uncategorized. You can follow any responses to this entry through the RSS 2.0 feed. You can leave a response, or trackback from your own site.